Info Sidney Williams (born March 3, 1942 in Shreveport, Louisiana) is a former American football linebacker in the National Football League for the Cleveland Browns, Washington Redskins, Baltimore Colts, and the Pittsburgh Steelers. He played college football at Southern University. Williams grew up in Houston, Texas and graduated from Phillis Wheatley High School in 1959. He is the husband of Representative Maxine Waters (D-CA). 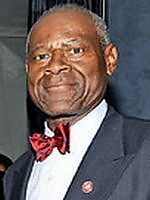 He served as the United States Ambassador to the Bahamas under the Clinton Administration.